It has been suggested that Creatine supplementation can help the energy reserves in muscles by increasing Phosocreatine (PCr) stores, which in-turn support the resynthesis of Adenosine Triphosphate (ATP), the body's primary source of energy. For athletes, this can result in support and energy output during exercise, increased muscular endurance, faster recovery time, and an overall decrease in performance fatigue. Train harder, longer, and recuperate faster with one of the safest and most researched sports supplements on the market. 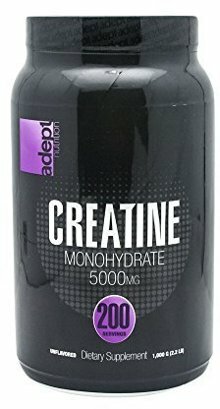 Directions: Mix 5 grams (1 scoop) of Adept Creatine with water or juice. On athletic training days: Consume with a meal or immediately after training with your post-workout proteins shake. On non-training days: The use of Creatine can help maintain muscle saturation. Warning: These statements have not been evaluated by the Food and Drug Administration. This product is not intended to diagnose, treat, cure or prevent any disease.